Throwing a party for your little one and need entertainers, party places or ideas for toddler parties in NY? Look no further than this list of great toddler party services NY has to offer for. 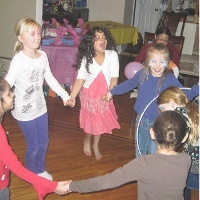 Parties for young kids in New York are easier to plan when using our simple directory. 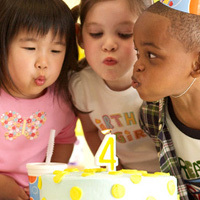 View this additional resource for toddler parties in NY when planning your child's next birthday. Kids love Marcia the Musical Moose at their NY Toddler Parties! A Variety of Toddler Party Options! If you need entertainment for your toddler's birthday party look no further than Daisy Doodle. This consummate entertainer offers a variety of toddler shows so you can choose the one that would best suit your child. Whether you want her to appear in costume as Dora the Explorer or Elmo, or you'd rather her come as her colorful self, she can accommodate. Daisy Doodle's toddler parties include a lot of visual stimulation, fun music and dancing. Puppets, bubbles, sing-alongs and props keep children engaged from start to finish. 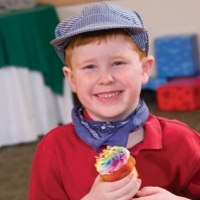 These parties are perfect for children ages 1 through 3 years old. Great for Kids as Young as 1 Year Old! Company's Coming's parties are ideal for kids as young as 1 year old all the way up to 7 years old. 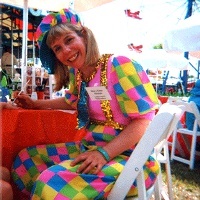 When you have Mary Ellen entertain at your child's birthday party, she can come as a variety of costumed characters including rag doll Annie, fairy princess, cowgirl, checkered clown and much more. Age appropriate music, puppet shows, circle games and more will keep the children engaged from start to finish. Lots of participation mean even the shyest child will get a chance to shine. Bubbles and face/hand painting will delight all the children and make this NY toddler party one to remember! Fun Party with No Stress! When you choose Gymboree for your toddler's birthday party everyone will have a blast. Choose a party theme and create a customized party experience perfect for your little one and his or her friends. An enthusiastic Gymboree teacher will lead the children in games and activities that will keep all the little ones engaged and smiling. These parties are ideal for kids from 0 to 5 years old. All party supplies such as balloons, plates, cups, candles and invitations will be provided as well as goody bags and a special gift for the birthday child! Indoor Party Place Perfect for Small Kids! 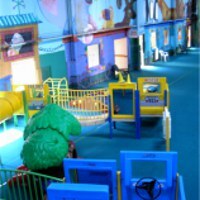 This huge play place is a great place to host your toddler's birthday party. With a special zone just for toddlers and small children there are things to climb on, slide down, jump on and play with in this colorful and open play area! When you have your party at Fun 4 All you will get one and a half hours of party time! Everything is provided for you when you have your party at Fun 4 All, from plates and food to a decorated party room and party host! Fun 4 All is perfect for NY toddler parties year round and is open 7 days a week! Fun Play Time and Tons of Add-On Options! 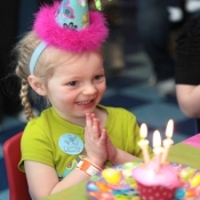 Have your toddler's birthday party at Active Kidz Long Island and make it a day they will never forget! With tons of fun activities, playground equipment, toys and more, the children will have a blast from start to finish. When you have your child's party at Active Kidz Long Island the children will get 30 minutes in the Toddler Center, 30 minutes in the Inflatable Fun Zone and 30 minutes in the private party room where pizza or bagels and drinks will be served. See about add-ons to make the party even more fun such as treasure hunts, crafts, character visits, pinatas and much more! Fun Toddler Party with Playtime and Rides! This family arcade and party center has tons of activities and games for kids of all ages. 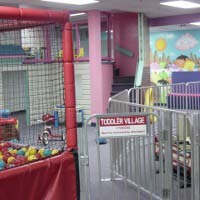 A special Toddler Village area is geared specifically toward younger kids and is great fun for boys and girls alike. With things to play with, climb on and crawl through kids will be delighted when you have their party here. Choose the PeeWee party package that is geared toward kids ages 1-5 year old and includes time in the climbing maze and toddler area, and a ride on the airplane or mini-twister ride. Food and cake is provided by Fun Station USA and many party add-ons are available. Mickey Sharkey is a professional entertainer of people of all ages. 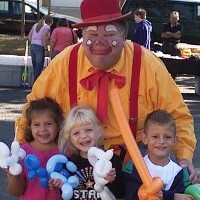 He can delight both children and adults with his juggling, magic tricks, balloon animals and fun antics. When he entertains at toddler parties in NY he is sure to bring along his puppet friends which will bring a smile to the face of even the shyest child. 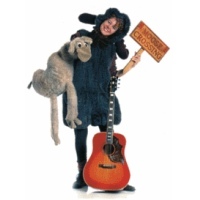 Your toddler and his or her friends will have fun watching, laughing at and participating in Mickey Sharkey's shows. Ask about adding on special face or hand painting for all the children at the party. 3-Hour Parties at Kids Fun House! Kids Fun House is a party and play place that's wonderful for toddlers parties in New York. With special party themes to choose from, a dedicated party host and a special toddler area created for kids 6 months to four years old, this is the perfect place to hold your young child's birthday party. Choose from several party packages that are appropriate for young children such as the pirate and princess theme party, the character party or the candy party. Customize your party package with add-ons such as face painting, a filled pinata, a magic show, special balloons and much more! Bouncing, Climbing and Playing at This Party Place! Toddler parties are more fun when you hold them at Kango Play Center! 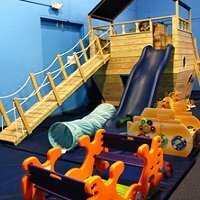 This great play place has so much for kids to do - from the custom designed climbing structure to the bouncing area to arcade-style redemption games, your child and his or her friends will have a blast when you hold a birthday party here. Birthday parties include a special host or hostess to make sure everyone is having fun, special party invitations, themed plates, cups and balloons, a private party room and food and drinks for the party guests. 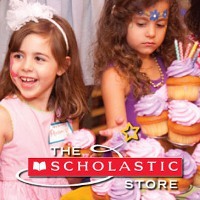 Give your child a truly magical birthday experience when you have his or her party at the Scholastic Store. Choose from a wide range of themes that are targeted to your child's age group, from "Animal Parade" and "Farm Fun" which incorporate animal stories, crafts and dances, to "Extreme Racer" where the kids can build and decorate their own race car! Cupcakes and juice are included with each party as are two party hosts, crafts, story time, music and games. An unforgettable experience for everyone involved! Stimulating Play and Party Space! 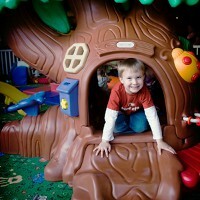 City Treehouse is a fun play place that is targeted toward children from 18 months to 8 years old. It includes many colorful and fun interactives which stimulate the imagination. A two story treehouse, multi-tiered stream table and soft play area keep children fascinated and having fun. When you have your toddler's party at City Treehouse it includes use of the playspace and all its fun activities and a special studio room for cake and presents. Catering options are available for your party food and cake. City Treehouse is open 7 days a week. Fascinating Parties for Little Ones! Choose NY Kids Club as the perfect venue for your toddler's birthday celebration. This brightly colored, clean and fun party and learning space is ideal for small kids to have fun. Choose from several toddler-friendly themes such as the Jump N' Jive theme and the Musical Tots Birthday. All birthdays at NY Kids Clubs include 1.5 hours of facility usage exclusive to your guests and activities and games led by an experienced birthday leader. Add-ons and upgrades can include food for all the guests, a birthday cake, balloons and more! 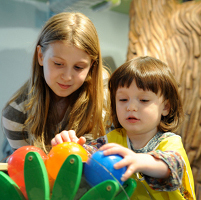 Have your child's birthday party at a magical place in Rochester NY called The National Museum of PLAY. Filled with exhibits featuring children's beloved cartoon and storybook characters, interactive displays and brightly colored fascinating collections of toys, games and more. Parties at this museum include a special party room, half price admission for party guests, catering from the food court and optional add-ons such as face painting and costumed characters. Your child and guests will have a blast exploring the museum before and after the party when you throw this great NY toddler party! Gotta Party Kids Entertainment Inc. Your child's party will be unforgettable when you have the entertainment provided by Gotta Party Kids Entertainment. These professionals offer many party services such as clowns, magic shows, face painting and more. When you choose the special Toddler/Puppet Party theme that is geared especially toward children under 5 years old, your child and guests are sure to love it! A cute clown, sing-alongs, bubbles, parachute play, dancing, face painting and balloon animals will make this party an event to remember! Many add-ons are available if you would like to extend the party or make it even more fun.